Harefjord („Hare Bay“) is the innermost branch of Scoresbysund, furthest to the west and nearest to the Inland Ice – together with Vestfjord a bit further south, but this one is usually so packed with glacier ice that it is not navigable. Harefjord is usually open and passage is easy. There are two glaciers with calving ice cliffs at its head. They certainly are not Greenland’s largest or most active glaciers, but both of them are beauties, coming down from the nearby inland ice, which is towering just behind and above them. 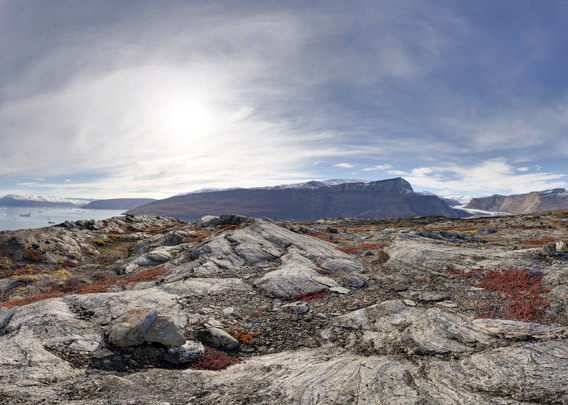 The slopes around inner Harefjord are mostly pretty steep, but not too steep for the occasional patch of tundra every here and there, giving muskoxen and the namegiving Snowy hare space to live and to roam around. And as almost always in Greenland, you can only regret silently that time is usually more or less limited, because it would be easy to spend some days with fantastic hikes in Harefjord, on the boundary between Scoresbysund as one of the world’s largest fjord systems and the very inland ice of Greenland.